Have you ever found yourself thinking any of these thoughts or maybe you’ve even said them to your partner in frustration? We all want our partners to show they care about us. We want to know that we’re important to them – that they think about us and want us to be happy. However, caring is not the same thing as mind-reading. When we expect someone to anticipate our needs or desires without having to tell them what those things are, most of the time it sets us up for disappointment. You probably feel let down and angry when you don’t get what you were hoping for, and your partner feels confused and frustrated because they didn’t know that you had such an expectation. No matter how much someone loves or cares about you, they will never be able to read your mind. You have to ask for what you need. Don’t expect your partner to pick up on your non-verbal “clues.” These hints are often ambiguous and easily misread. 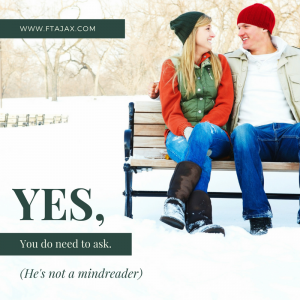 In reality, if you get what you want by “dropping hints,” it doesn’t mean your partner thought of it on their own – you still communicated it to them; you just used body language and indirect language rather than being clear and honest. Relationships should never be about playing mind games. If you say something is “fine,” or tell somebody not to worry about doing something for you but expect them to read between the lines and do the opposite, that’s a set up for disappointment. Having to ask isn’t a bad thing. It doesn’t mean your partner doesn’t “get you” or doesn’t care. If your partner communicates to you that they genuinely care and want to please you but need you to let them know what it is you’d like them to do, that is absolutely okay. Sometimes they want may want to please you but simply don’t know how. Their ideas about what loving and caring look like may be completely different than your own. Consider where you come from. For some people, communicating their requests is difficult. Some are raised in an environment where communication was poor, distorted, abusive or manipulative. Other families ignore issues or “brush them under the rug.” In some families, members are taught the belief that asking for what they want is wrong or selfish. If you’ve tried improving the communication in your relationship on your own but are still struggling to get your needs met and ask for what you need, our team of highly trained therapists specialize in helping you identify your needs and communicate them clearly and effectively. We are here and ready to help you today – all you have to do is ask. You may also find our Luxe Couples Retreat to be the perfect fit. Click here for more information about how you could spend a week in paradise focusing on your needs, communication, intimacy and other valuable relationship skills.